The Best Time to Visit Victoria Falls and other safaris destinations in Zimbabwe such as Hwange National Park or Mana Pools is most of the year, but really depends on what activities you wish to engage in. Zimbabwe, one of the most beautiful countries in Africa, abounds with the most stunning natural features that will leave you awestruck! With Zimbabwe’s tourism industry rapidly on the rise, it is the perfect time to visit this amazing country. Zimbabwe is essentially perched on a high plateau and, despite being situated at tropical latitude, the climate is cooled down by the altitude. So the weather is ideal to explore the impressive natural, cultural and historical sights that Zimbabwe has to offer. The thundering Victoria Falls is a must-see on any visit to Zimbabwe and is the country’s most iconic feature. The waterfall spans the entire width of the mighty Zambezi River at one of its widest points before it plunges into a deep basalt gorge. The crashing water creates an enormous plume of shimmering mist and, when in full flow, the mist rises 500 metres (1640 feet) above the falls and can been seen up to 50km (31 miles) away! Designated a World Heritage site and one of the Seven Natural Wonders of the World, this remarkable spectacle is worth taking some time to experience. The town of Victoria Falls is located at the western end of the waterfall and is a major tourism hub for all of the great activities in this region of Zimbabwe. Hwange National Park is in close proximity to Victoria Falls and is Zimbabwe’s largest game reserve at 14,650 square kilometres (5650 square miles). Hwange’s vast size encompasses a diversity of habitats including desert sand, woodland, open grassland and granite outcrops and sustains a huge variety of wildlife and bird species. The reserve offers a true bush feel and great game viewing, especially in the dry season. Picturesque Mana Pools National Park is north east of Victoria Falls in the beautiful Lower Zambezi Valley. The Mana Pools are situated inland from the Zambezi River and are an amazing wetland area of great importance to an abundance of wildlife and birds, especially in the dry season when many other water sources dry up. 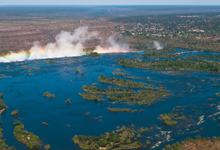 The four main permanent pools, occupying an area of almost 2200 square kilometres (850 square miles), are actually remnant ox-bow lakes formed by the changing course of the Zambezi River over millions of years. Gonarezhou National Park in the remote south eastern corner of Zimbabwe is the ultimate in untamed African wilderness and raw beauty. This stunning region offers classic African scenery and the enormous red sandstone Chilojo Cliffs provide a striking game-viewing backdrop. Despite Gonarezhou’s tucked away location, a visit to this pristine part of the world is well-rewarded.